Call (512) 389-4848 or contact your regional Kills and Spills Team biologist. Prompt notification is key to a successful investigation. The sooner we arrive, the better the chances that our biologists will be able to collect useful evidence. The Texas Parks and Wildlife Department Kills and Spills Team (KAST) is a group of biologists who investigate fish and wildlife kills resulting from pollution and natural events. 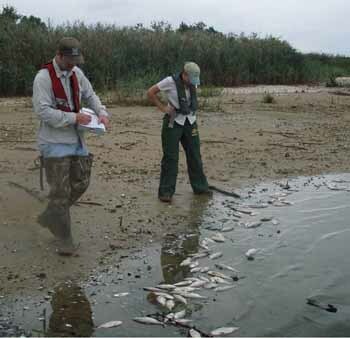 KAST staff are trained to assess impacts to fish and wildlife resources and to determine the causes of events.